"Grappling with what to ask 2 famous Japanese sumo wrestlers"
It can be hard to get a table at Nabe. 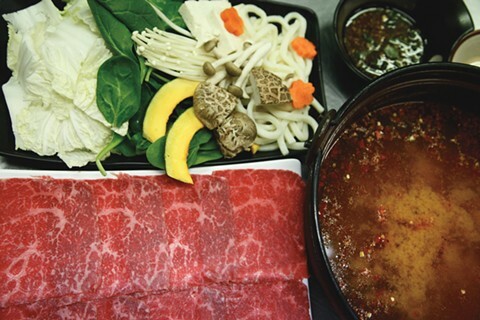 Quietly humming along for about a year without much press since its opening, the Japanese restaurant’s popularity isn’t surprising, considering it’s one of the few authentic Japanese hot pot places in The City. Awash in steam, with condensation dripping down the plate-glass facade, the eatery is toasty; you’ll want to slough off extra layers of clothing once the bubbling broth begins to simmer at the table. Since Nabe opened in January, I’ve walked up and down Ninth Avenue scoping out this new nabemono hot-pot restaurant. It’s easy to miss, because steam from the cooking pots clouds the glass windows, while shielding its patrons from the cold night.